In the 1970s, mailman Jeff McKissack took a modest property in Southeast Houston and transformed it into a monument to the orange. He finished it in 1979. I recall as an undergraduate at Rice University during the 80s going over there to see rock shows--McKissack had build a small stage and bleachers. The seats were old tractor seats. His working class neighborhood had no deed restrictions and Houston famously has no zoning, so there was nothing to stop McKissack from building his dream. While the Orange Show is the best-known example of "visionary architecture" in town, Houston, it turns out, is full of this kind of build environment, this sort of outsider architecture. (I realize that "outsider" is a problematic term, but I can't think of a better way to describe people like McKissack.) 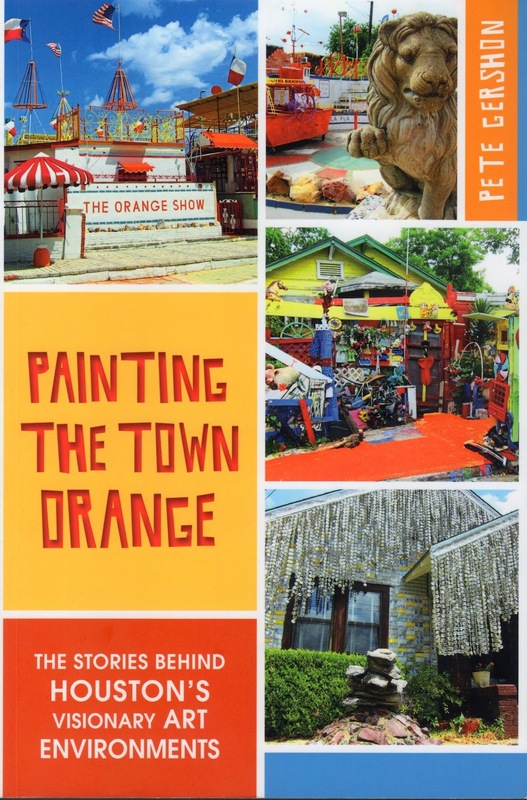 It's high time someone wrote a book about them, which is what Pete Gershon has done with Painting the Town Orange: The Stories behind Houston's Visionary Art Environments. The Orange Show, the Beer Can House, the Flower Man's House and even Notsuoh are described, as well as many that weren't saved and exist only in photographs and memories. But if Painting the Town Orange were merely a guide book, it would be of only modest interest. (Likewise, if it were a book of criticism about these places, I'd be intrigued but I'd still likely find it less useful than Gershon's book.) 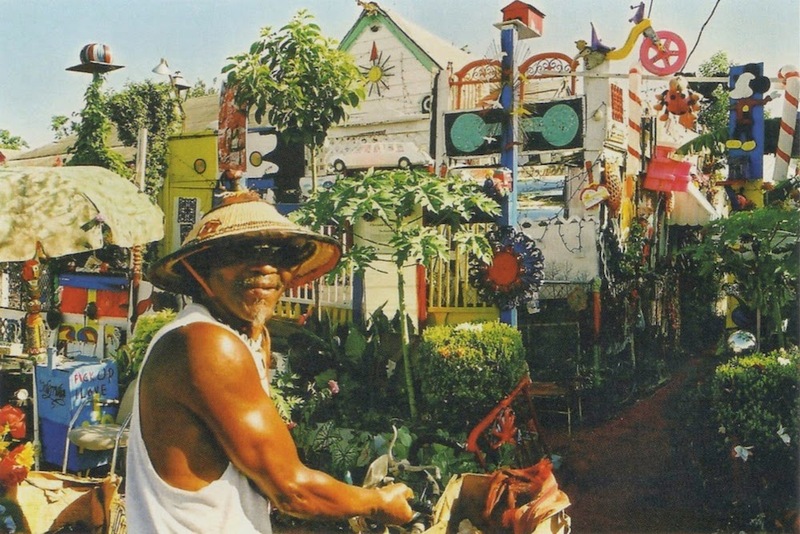 What Gershon has done is thoroughly researched each artist's life, particularly McKissack, John Milcovisch, the creator of the Beer Can House, and Cleveland Turner, who was the Flower Man. Now why people create structures like this is to some extent unknowable, but Gershon shows how their biographies at least lead them to a certain point where doing something like this--something both very public and highly eccentric--seems like an option. And beyond that, Gershon thoroughly reports how the structures were saved--how each one was discovered by people who considered it worth the considerable effort required to acquire the works (usually after the death of the artist), restore them if necessary, and preserve them. These stories end up being more complicated than one would expect. For the people who did this, there was no particular roadmap, no handbook on how to save outsider architecture. Personalities like sporting goods heiress Marilyn Oshman, who was instrumental in saving the Orange Show and artist/activist Rick Lowe, who did the same for Cleveland Turner's house, are a big part of the story that Gershon tells. 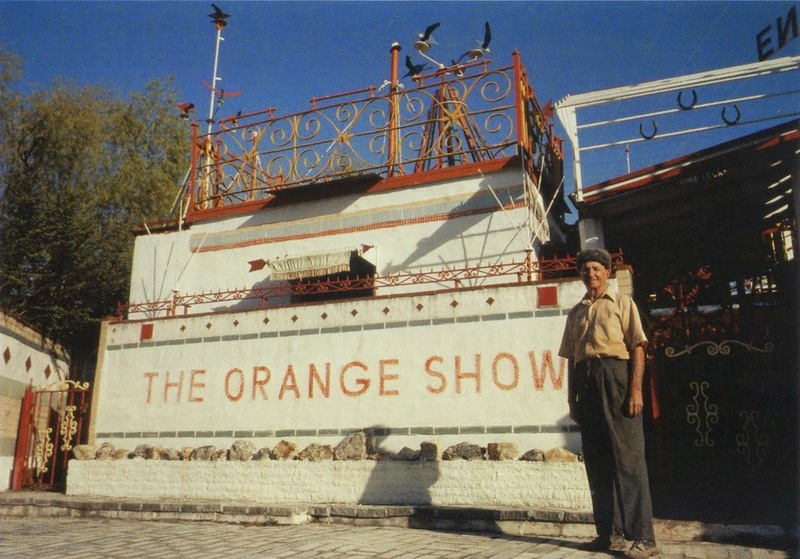 As if to emphasize the sometimes miraculous circumstances that lead to a place like the Orange Show being preserved, Gerson includes a chapter entitled "The Lost Environments." He writes about Pigdom, the "shrine to swine", and Bob Harper's Third World. What often happens with this kind of place is when the artist dies, the heirs don't have the resources to preserve the structures and aren't connected to a local art community that could help. The places become dilapidated and dangerous, and often the city red tags them. The bare minimum of what a visionary environment requires to survive is to be widely recognized within the local art community as art. And even that may not be enough. Gershon moves away from "outsider" environments to discuss Notsuoh, which is a functioning bar/performance space run by Jim Pirtle, and Zocalo/TemplO, an environment that was built by Nestor Topchy. Dan Phillips and the Phoenix Commotion, a company that builds highly eccentric art houses out of materials headed for landfills, are also discussed. Pirtle and Topchy both come out of the Houston art world and Phillips was a dance instructor at Sam Houston State University--none of them are really "outsiders"--but Gershon identifies the impulse to build an expressive environment as a common feature between them and McKissack and Turner. There are environments such as this all over the world. Houston's are neither the biggest nor, in my opinion, the most beautiful. (I'd probably vote for the Watts Towers.) But they are tightly woven into the fabric of Houston, and the stories of how they came to be made and how they ended up saved are fascinating. There is something about Dallas that makes me want to make grand pronouncements about it, to sum it up in one pithy catch-phrase. Hence the vast three-part post I did in 2012, and a subsequent post that is sort of the antithesis to the first three posts' thesis. I wish I had a similar overarching thing to say about Dallas for this post. I'll outsource that to Paul Middendorf, who recently wrote an excellent two-part overview of the Dallas scene for Glasstire recently. He looked at what was happening in many of the small experimental/grass roots art spaces and tried to draw conclusions from what he saw. 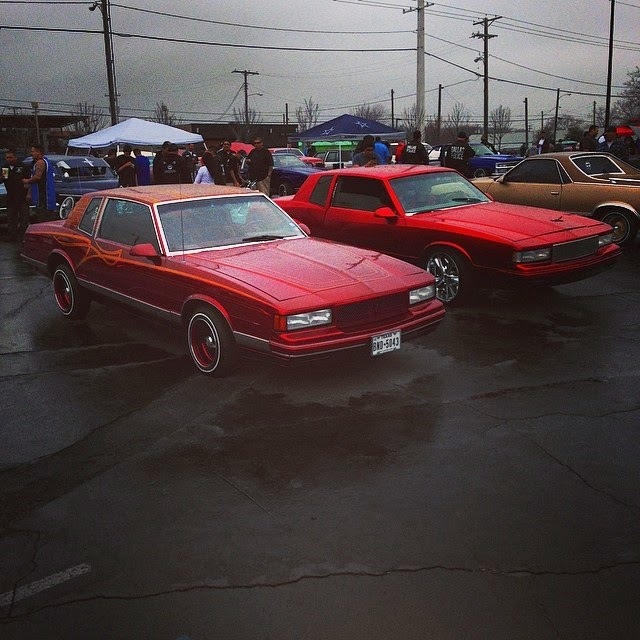 I know many of us in Houston look enviously on this scene. 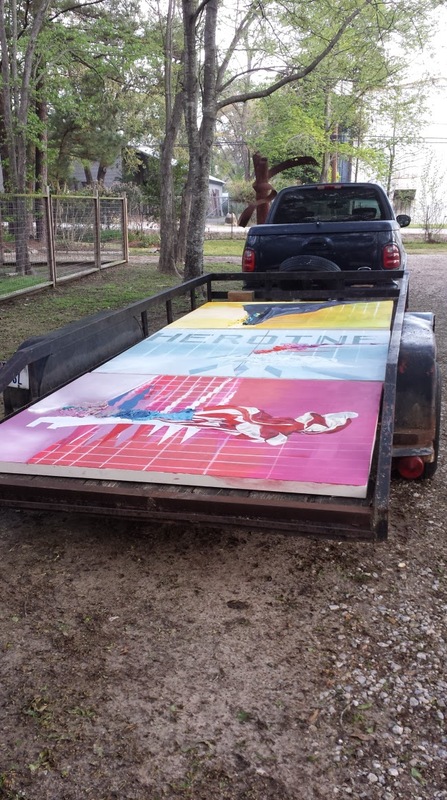 Middendorf seems to think that the artists residency CentralTrak and its director, Heyd Fontenot, were really the underlying engine behind a lot of this activity. Without being able to trace CentralTrak's specific influences, this nonetheless rings true to me. So, Middendorf has Dallas pegged, right? 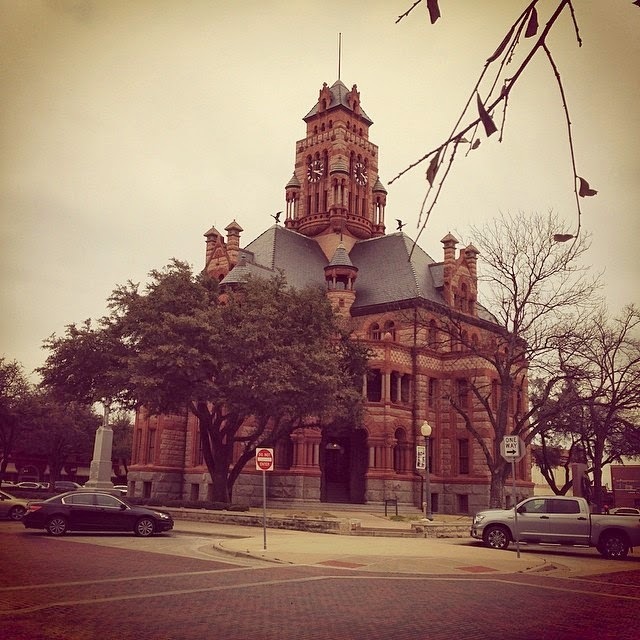 So two very diverging views of the Dallas art scene were fresh in my mind as I swept into town. My first stop Friday was Ware: Wolf: Haus, an alternative space in the shadow of the big Santiago Calatrava bridge over the Trinity River. I guess it's things like Ware: Wolf: Haus that are supposed to help convince Dallasites that this isn't actually a bridge to nowhere. They had a show featuring Matt Koons, Allison Ginsberg and Randy Guthmiller up. But apparently no one from Ware: Wolf: Haus was around, and the other people in the building didn't want to let me go in. "Now is not a good time," I was told. I would subsequently learn that Friday is in general not a good day to try to check out alternative spaces in Dallas. I crossed the Calatrava and headed into the Design District. At Red Arrow Contemporary, there was a show of work by Apophenia Underground, a collective consisting of Jeff Gibbons and Justin Ginsberg. I was told it would be better to see at night--one of the pieces was a projection onto semitransparent material covering the front windows. It would be visible from outside and inside. That sounded cool and I made a mental note to return later that evening (the galleries in the neighborhood were apparently open late that night). But that night I decided to go see The Grand Budapest Hotel instead. Apophenia Underground's work at Red Arrow wasn't brilliant. All conceptual work is dependent on the quality of the idea, and this seemed like the kind of conceptual work that Donald Barthelme complained about--too easy. But some of it was visually striking, which for me can turn a weak conceptual artwork into something exciting. There was something mysterious and cool about seeing the video in Lock All the Doors only as a blue shimmery reflection on the floor, for example. Post Cards and Leaf consisted of a sheaf of postcards (not pictured) and a big leaf on top of an old portable television. The TV glowing through the leaf is intriguing, and I liked how the TV image was obscured as it had been in Lock All the Doors. When you crouch down to read the type on the leaf, you will laugh. It's not exactly a work that can be collected (the leaf will curl up and disintegrate eventually, right?). That Red Arrow is showing work like this makes me ask, is Red Arrow in fact a commercial gallery? I think so, but this is unusually adventurous work for a commercial gallery. And that's exciting. I like seeing a gallery that isn't 100% about selling very expensive merchandise. Not that there is anything wrong with selling art. Especially art as pretty as the Geoff Hipenstiel paintings at Holly Johnson Gallery. This was the first of several gallery shows I saw in Dallas featuring the work of Houston artists. I think that it's great that the two cities should share its artists. What I wonder is that for artists selling their work through commercial galleries, does showing in Dallas help--does more work get sold? Does their base of collectors expand? The answer has to be yes, or else Houston artists wouldn't have shows up at Holly Johnson Gallery, Talley Dunn, and Barry Whistler. But beyond those purely mercantile concerns (probably more interesting to me than to the readers of this blog), the Hippenstiel show is gorgeous. Up to now, I've been dealing with his work in terms of technique and formal matters, but what I realized when I saw this group of paintings was that Hippenstiel is devoted to making paintings that are beautiful, whatever other qualities they may contain. He has long painted images of rounded hills, but with no title (Mount Saint Victoire), he makes for the first time a reference to the greatest hill painter of all, Cezanne. Cezanne was another painter concerned with formal qualities of paint who nonetheless ravished the viewer with the beauty of his paintings. No title (Mount Saint Victoire) is an apt homage. While most of the show is work that feels in line with work Hippenstiel has done before (hills, a large skull), these homages feel like he is staking a claim to the tradition of paintings that are so beautiful that they border on the sublime. Hence his tributes to Barnett Newman. But while Newman was deliberately going for the overwhelming experience of the sublime, Hippenstiel dials it down. His painterly versions of Newman's zips are a bit more polite and domesticated. They're pretty in a way that you would never say of Newman's paintings. That may have been Hippenstiel's intent. At Ro2 Gallery downtown, there was an exhibit of fake fossils and artifacts putatively from an archeological dig in Europe, including the Adolescent Unicorn T-Rex Skull with 'No Fear' Bedazzlement. Ever since the Museum of Jurassic Technology, "fake natural history" has become its own genre of conceptual art. I can appreciate the elements of institutional critique that originally informed this genre, but this kind of work feels tired and old-hat now. This show, that posited a discovery by artist Joshua Goode of an ancient "Texas" culture in Europe was especially feeble. The show is one big joke which is not redeemed by being particularly funny. I traveled north to Talley Dunn Gallery to see the Joseph Havel show, Stacks. Some of the work on display I had seen at Hiram Butler Gallery back in 2012, but the main work, the sculptures of stacks of books, was new to me. Talley Dunn Gallery reminds me a lot of Hiram Butler Gallery; both feature very tasteful art, some of it blue chip, and both are geographically isolated--they aren't near any other galleries. Someone told me while I was up there that they found it hard to attend openings at Talley Dunn because of this. To me, Havel is memorializing that culture here. Except for their vertiginous height, the piles of books he portrays could be taken from my bedroom. By casting them in translucent resin, he effectively turns them into ghosts--ghosts of a period when owlish intellectuals had their own vast personal libraries, hoarded higgledy piggledy in cramped apartments. A silly article in Vice recently brought the demise of this culture home with one line, "He owns more hoodies than books." Talley Dunn had an odd selection of other work hung as well, including this great Vernon Fisher painting of World War II military movements in Belgium, but not excluding Nancy, Sluggo, a clown and pixelated battle scenes. I asked the gallery attendant about it, and she launched into an explanation and asked if I had ever read the comics strip Nancy. Boy had I! I used the opportunity to paraphrase Wally Wood--"Sure! After all, it takes more energy not to read Nancy than to read it!" Next stop was the Meadows Museum at Southern Methodist University. The campus was beautiful, and the museum stately. The main show up was work by Joaquín Sorolla y Bastida, and it was nice enough. The beach scenes he painted were fun. But when you see an artist like Sorolla, you understand why Modernism so desperately needed to be invented when it was. I wasn't allowed to take photos of the Sorolla show, but if you click through above, you can see some examples of his art. But there was Spanish art there that I really liked, like this energetic Antonio Saura. But then here's some Spanish art I hate. Jaume Plensa is one of those artists when you first see their work, you might think it looks pretty cool. But over time, the novelty has worn off and all that's left is its banality. That might be acceptable except for the fact that it has pretends to be intellectual and full of meaning. This transparent, empty head is ironically a good symbol for Plensa's work as a whole. Nobody home. That the novelty of a piece of art might evolve into banality is a risk with Santiago Calatrava's fountain in front of the Meadows, but for now I like it. Much of Calatrava's work seems to be based on some complex application of physics to engineering (he certainly doesn't seem to very concerned with the human element of architecture), so this is an apt sculpture for him. The metal parts move, creating a continually propagating wave-form. One reason I like this is that we had a desk-top version of this in my High School physics class back in the 70s. It's a work that fills me with nostalgia. It was mid-afternoon by now, and I still wanted to see some more stuff. I left the Republican wealth of University Park and headed down to the still somewhat grungy (but gentrifying) neighborhood of Exposition Park, right next to the Texas State Fairgrounds. My intent was to check out some of the tiny alternative spaces in the neighborhood. First I went to the Power Station (which actually isn't tiny at all). This once was a facility for Dallas Power & Light, this beautiful building somehow managed to avoid being razed or turned into condos. The day I went, I went through the front door and found a darkened empty space. It was a little freaky. No one was present. The darkness was an intentional feature of the installation. One fluorescent light flickered on and off at regular intervals. Only after a while did I realize that there was some stuff on the floor. This was an exhibit by Michael E. Smith. Jawbreaker looked kind of cool. I thought about stealing it, since there was no one around. But fortunately I have some sense of morality left. The pile of hats near Jawbreaker, on the other hand, just made me shrug my shoulders. They wouldn't even be worth the effort of stealing. This upside down milk jug was hanging above the side door. There was a little garden on the side of the building, as well as stairs leading up. I climbed them to a mezzanine level, where there was another similar milk jug hanging over the door. Inside were several more objects in the dark, including this disturbing piece. Weirdly enough, I totally missed two pieces that afternoon. The reason was that even though it was pretty dark in the Power Station (the windows had all been blacked out), there was plenty of sunshine pouring in from the side doors. It was, in fact, a beautiful day in Dallas. It wasn't until I came back the following night that I saw two of the most visually striking pieces. And if you will recall, there were two lights flanking the entrance of the Power Plant. With the simple act of adding plastic coral inside them, Smith turned them into a totally creepy installation. 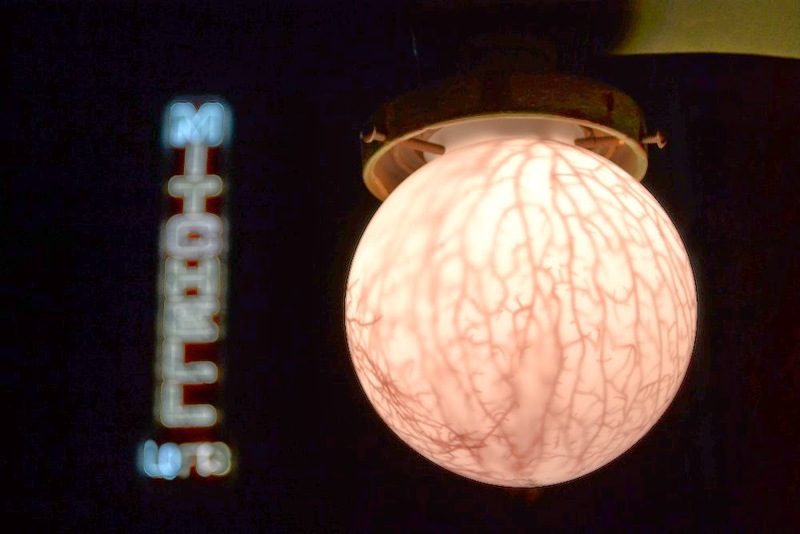 These glowing fleshy protuberances, like perfectly spherical testicles or some alien life form, were the best part of the show. But over all, the exhibit felt like a waste of that great space. There just wasn't enough there there. The plastic encrusted basket ball, the veiny lights--by themselves, these were intriguing objects. But all together, it didn't add up in any meaningful way. 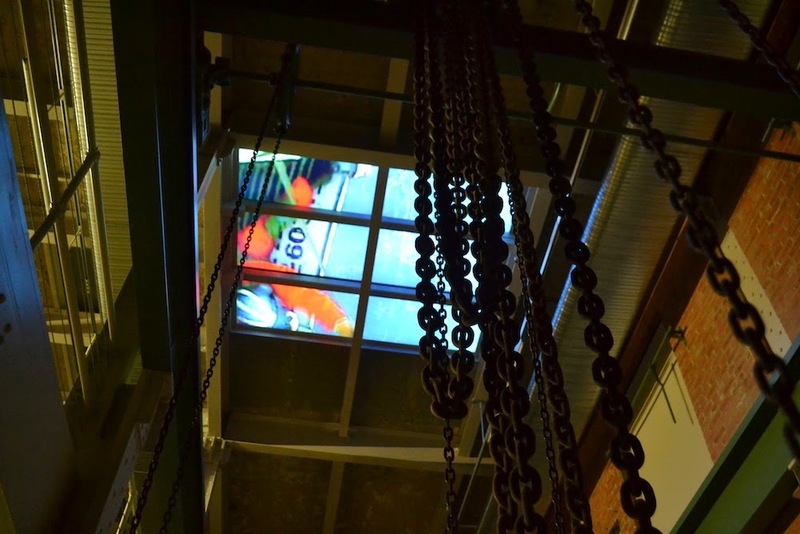 However, I was interested in and impressed by the amount of work Smith put into using the Power Plant itself as a key element of the exhibit--the blacked out windows (obviously a huge amount of work), the single blinking fluorescent tube. And strangely enough, even though I was there for a while, I never saw another living soul. That was perhaps the most memorable thing about the show. Next I wanted to see 500X, the Reading Room and the Oliver Francis Gallery. 500X was closed and I couldn't find the Reading Room (my phone couldn't map the address, and when I tried to call them, no one answered). Not to worry--I saw both of the spaces Saturday. Francis Oliver Gallery was about a half mile away, and it was such a beautiful day that I decided to walk over. 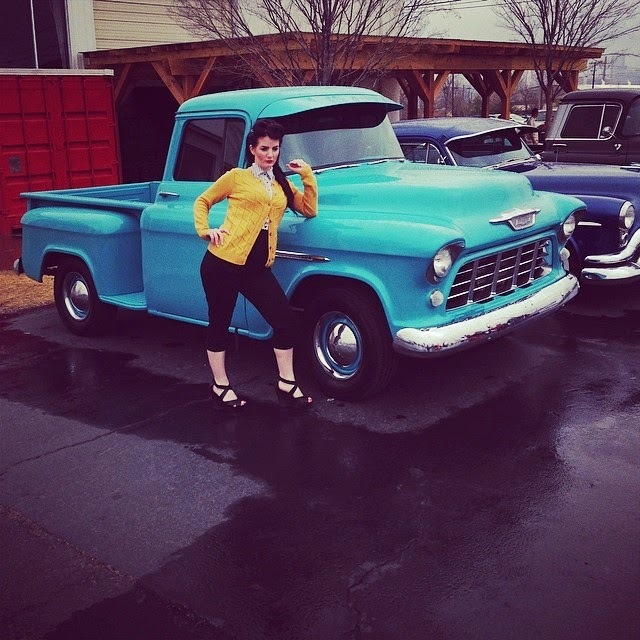 It was worth the walk--this transitional neighborhood had a lot of interesting things to see. If the galleries were going to be closed, I would take in what visual stimulation I could find. seen on East Side Ave. I loved that there was a narrow pointed building on this skinny little block. But alas, Oliver Francis Gallery was also closed. It would end up being the only alternative space that I wanted to see this weekend that I didn't. At this point, I was all arted out. The quest for art would continue Saturday. Any big conclusions about Dallas? Not really, but I notice that almost none of the art I saw that Friday was by women. There was a nice piece by Robin O'Neill at Talley Dunn and a not-very-memorable show by Anna Bogatin at Holly Johnson. But that was it. So that kind of validated some of Darryl Ratcliff's findings.